LOS ANGELES, California -- A plus-size model is speaking out after she was mocked for her weight by a fellow passenger on a flight. Natalie Hage was on an American Airlines flight headed to Los Angeles when she quickly became involved in an altercation with the man sitting next to her. Hage said she paid almost $70 extra for a seat with extra leg room. However, the seat made the model anxious because it was a middle seat, and she didn't want to become the talk of the flight. And once she boarded the plane, all of her fears came true. 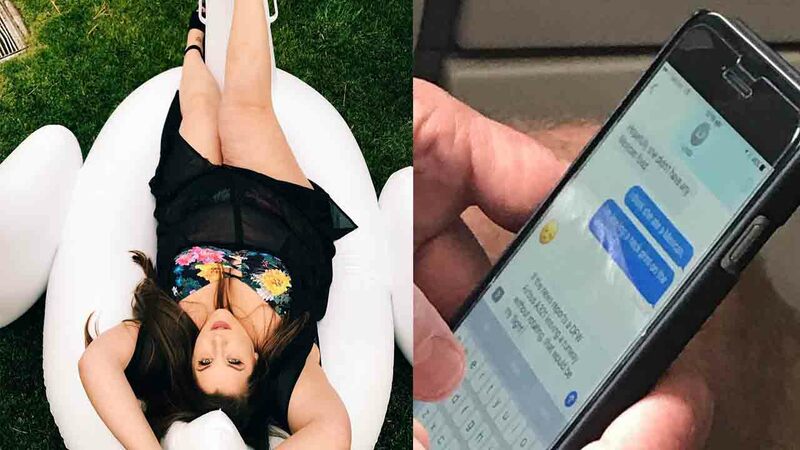 She said as soon as she sat down, the man sitting beside her began loudly "huffing, sighing, and readjusting himself in his seat," and then began furiously texting someone. Hage said the man would purposefully turn his phone away from her so she couldn't read his text messages. So, when he turned his phone towards her again, Hage took a quick peek and was hurt by what she saw. "Hopefully she didn't have any Mexican food," one of the texts read. To which the man replied, " I think she ate a Mexican." As Hage snapped a photo, the man was typing, "If the news reports a DFW airbus A321 leaving a runway without rotating that would be my flight." The man also claimed Hage was squishing him, causing him to leave a mark on the window. Hage claims she told the man on her right what was going on and asked if he'd switch with her but he "laughed and refused." "That's fine, it's not his issue," she said in an Instagram post. "This is a fat person's daily reality and not just on a plane. This is on a bus, standing in line at the grocery store, at a concert, (and) on the internet. You can be completely in your own space, not bothering anyone, and people will still f*ck with you and try to hurt you. All you can do is know you haven't done anything wrong just by existing and to move on. This just makes me a mixture of enraged and super sad." In the video shared on her Facebook page, Hage confronted the man, saying she knew he had been talking about her. Following their interaction, the man apologized to Hage offered to take her out to dinner. Within a few hours, Hage had received an outpour of support on her Instagram and Facebook accounts. In a special Instagram post, she thanked everyone for their kind words and support. "I wanted to say hello to everyone new joining my neck of the woods. Thank you so so so much for the messages and comments overflowing with kindness. My heart is full. I didn't want to leave y'all hanging - I actually ended up saying something to him when we landed. I couldn't NOT speak up. I'm so tired of fat people being a social punching bag. I won't stand for it. I hope this dude learned something today.